Engaging, thought-provoking documentary that delivers some insightful observations into Corbijn's work and offers a moving portrait of his personal life. 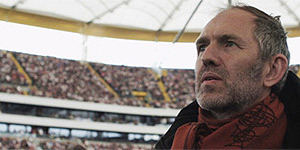 Directed by Klaarte Quirijns, Anton Corbijn: Inside Out is a documentary portrait of photographer-turned filmmaker Anton Corbijn (Control, The American). Quirijn's cameras follow Corbijn over a period of several months (judging by the appearance and disappearance of a continuity-troubling beard) that includes both the shooting of The American (Clooney makes an appearance but doesn't talk to camera) and photo-shoots with U2 and Metallica. As well as observing his work life, Quirijn also accompanies Corbijn as he visits his family (there are moving interviews with both his mother and sister) and gives the audience what amounts to a guided tour of his childhood, including the amusing revelation that he used to photograph himself dressed as his favourite musicians before he turned professional. He also delivers extended periods of self-analysis (both in Dutch and English) while lying on his own couch, though it's clear that he will only go so far, as evidenced by a later sequence where he literally walks away from a question deemed too personal. Corbijn comes across as a likeable, soft-spoken (one of the pleasures of the film comes in simply listening to him speaking his native language) and strongly introspective presence throughout and the film offers some intriguing observations about his work, such as the idea (suggested offscreen by Bono but repeated by Corbijn) that in taking intimate portraits of others, he is in fact taking pictures of himself. Corbijn also admits, movingly, to a strong sense of loneliness and explores that element in both his photography and his two feature films. Music also plays a key role in the film, as Corbijn talks at length about his own love of music, while Quirijns intersperses footage of her subject with both clips from his music videos and montages of his photos, set to music by the artists he has photographed. It's also fascinating to observe the strong working relationships Corbijn has built up with the musicians he admires, while in turn, members of both U2 and Metallica offer insightful comments on Corbijn's work. The film is extremely moving when discussing Corbijn's childhood and family life, whether it's Corbijn talking about his somewhat cold-sounding upbringing, Quirijns interviewing Corbijn's sister or a heartbreaking conversation between Corbijn and his mother, where she admits that she loved someone else but married Corbijn's father. If the film has a flaw, it's only that Quirijns lacks the courage to follow up on her unanswered questions, though it's also worth noting that the film never catches Corbijn at an unguarded moment, such as, say, losing his temper. Anton Corbijn: Inside Out is an engaging and insightful documentary that would play well on a double bill with the recent documentary about Annie Leibovitz (Life Through A Lens). Worth seeing.